Aloes are a very undervalued plant. They come in many sizes but they all need little attention and less water. 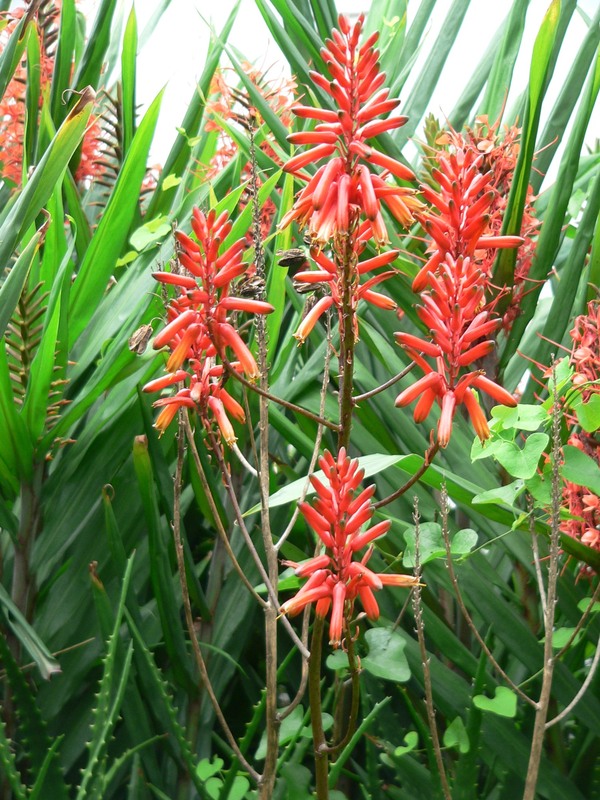 The flowers are attractive and long-lasting and best of all they attract sunbirds. Birds add something special to a garden. A flock of tiny blue waxbills, the bold masked weaver, the melodious bulbul, the bright metallic colours of the male sunbird are all a common sight in the garden. If you are lucky a pied wagtail will stroll across your lawn, wagging its tail. The tiny brown prinia is easily identified by its small size and its short tail sticking up at a jaunty angle. Palm swifts can fill the air with their flight as they catch insects in the early evening. Recently a little sparrowhawk has been spotted in gardens along our road, usually at the top of a tall tree. Part of the pleasure provided by a garden is the abundance of wildlife it attracts by offering food and shelter to birds, bees, butterflies and many other small creatures. Another great advantage is to be able to cut flowers for the house. You don’t need to be an expert to make a simple arrangement of flowers. Shasta daisies are easy to grow and their long-lasting white flowers will brighten any corner of the house in a simple glass container. Strelitzia or “bird of paradise” has exotic and unusual flowers that are eye-catching in a vase. In fact, any flower at all with a little creativity can become a source of beauty in your home. Watering is now a priority. Make it effective by watering in the morning or late afternoon when the ground is less hot. Don’t leave a hosepipe lying in the sun, as it will make the water so hot that it will scorch leaves. When not in use it should be in the shade. Mend any leaks in the pipe. Buy connectors and organise several lengths of hosepipe so that all corners of the garden can be reached by connecting them together. You may need to install a short rod of steel at the corner of a flowerbed so that the hosepipe being pulled over the ground is kept away from the flowers. Taps don’t last for ever: replace washers or the tap itself as required. Be systematic and have a timetable so that each part of the garden is watered regularly. Large trees and some shrubs will find water underground as their roots go deep. The smaller the plant and the shallower its roots, the more often it will need to be watered. In general, water deeply and less often. Automatic sprinkler systems seem to offer an easy solution but in practice the calcium deposits from our hard water soon clog the holes and the system is no longer effective. Keep an eye open for the drooping leaves that mean a plant has insufficient water. Cover the soil with a thick layer of compost or any mulch to reduce evaporation from the soil surface.